As a regular subscriber to my blog, you’ll know that I’m a big advocate of the adjustable kettlebell. So you’re probably wondering why I’m writing a Bowflex SelectTech 552 review? 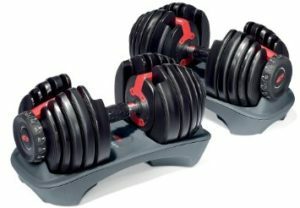 Having recently decided to increase my muscle mass, I decided to purchase a pair of Bowflex SelectTech 552 adjustable dumbbells. Dumbbell workout routines are less dynamic allowing you to focus on individual areas of the body i.e. biceps. Dumbbells are shaped differently, meaning there is less focus on the swinging motion used in kettlebell workouts. Having enjoyed the versatility my adjustable kettlebells, I knew from the outset an adjustable dumbbell would offer me much better value for money. I wanted a mid weight range so that I could condition and build my muscles. Now, six months down the line I have decided to add my own Bowflex SelectTech 552 review. Bowflex are an incredibly well-known and respected manufacturer. Best known for their adjustable dumbbells, Bowflex grew off the back of the success of the SelectTech 552. Since then Bowflex have started diversifying their product range offering the following: dumbbells, dumbbell accessories, bench presses, heart rate monitors , home gyms and running machines. All of their products are made from premium materials with innovative design features aimed at offering customers maximum convenience. As such, prices are usually toward the upper end of the scale. One of the sayings I often use is “you get what you pay for” – when you buy a Bowflex product you are guaranteed a well-made and long-lasting product. 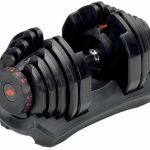 The Bowflex SelectTech 552 is an adjustable dumbbell pair allowing you to adjust the weight from 5-pounds, all the way up to 52.5-pounds. One of the best things about this model is the number of different weight settings available, 15 in total. Bowflex achieved this by dropping the adjustable weight increments to just 2.5 pounds. Adjusting the weights couldn’t be easier; you simply turn a dial to the desired level, which securely locks the weights into position. Shaped to be as ergonomically friendly as possible, the handle has ridges to improve grip. This useful feature minimises the risk of the dumbbells slipping when working out. Although I wear leather gloves during routines, it definitely makes a difference when pressing heavier weights over your head! The quality of the build is second to none, made from cast iron mine are still looking as good as new despite the knocks they have sustained. Having said that, Bowflex chuck in a two-year warranty so you’re covered if things do go wrong. 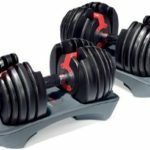 Let’s look at the features of these adjustable dumbbells and find out why they are regarded as the best adjustable dumbbells in the market. Warning: These dumbbells contain moving parts and should not be dropped on the floor. Doing so will void your warranty. Shipping weight: 150 Pounds (Remember the Bowflex SelectTech 552 is sold as a pair of adjustable dumbbells). 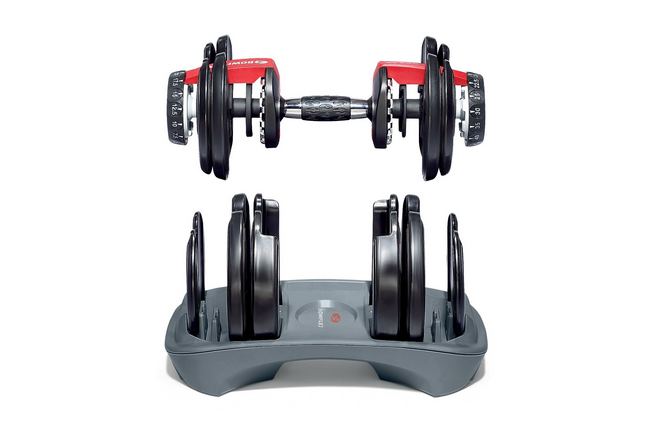 Weight range: Both Bowflex SelectTech 552 adjustable dumbbells adjust from 5 to 52.5 pounds. This is a great lower to mid weight range. Note – If you’re looking for a heavier weight range then you should consider the Bowflex SelectTech 1090. You get all the of the benefits of the 552 but the weight range goes from 10 to 90 pounds. Weight increments: There are 15 different weight settings to choose from with weight increments ranging from 2.5 for the first 25 pounds and 5 pound increments thereafter. Adjustable dial system: You adjust the weights by turning the dials neatly tucked away on the outer side of the dumbbells. The dial eliminates the need for you to pick up and manually adjust weights. Grip: The handles/grips are ergonomically shaped to provide maximum comfort whilst in operation. As mentioned the handle provides excellent grip to reduce slipping. Excercise range: With such a large weight range you can complete a number of different dumbbell workout exercises, including: legs, back, chest, abdominal, arms and shoulders. Save space: These dumbbells are absolute space savers. Compared to a traditional dumbbell set they are compact and provide much better versatility. As a test, I managed to store mine under my bed which is a bonus if you are struggling for space. Innovative design: It’s really easy to alter the weight setting. Unlike others on the market there is no need to unscrew, remove and replace individual weights. It’s all controlled by the twisting a dial mechanism. Price: At just over $300 dollars for the Bowflex SelectTech 552 pair, you’re getting superb value for money. A traditional dumbbell set covering a similar weight range would set you back in excess of $1,000. Wide weight range: At 5 to 52.5 pounds they are suitable for beginners and professionals. THe weight range equates to 15 different settings, these are:5, 7.5, 10, 12.5, 15, 17.5, 20, 22.5, 25, 30, 35, 40, 45, 50, and 52.5 pounds. Listed below you’ll find a great range of routines you can complete with the Bowflex SelectTech 552s. Weight range: As mentioned the 5 to 52.5 pound weight range will be suitable for most. But it doesn’t cover (or get near) the upper end of the scale. If you’re looking for something heavier you may want to consider the Bowflex SelectTech 1090. Build: As the dumbbells contain moving parts, it’s inevitable that there will be some rattling whilst in motion. This is more obvious during dumbbell routines since there is no swinging involved. I found the rattling/movement to be somewhat annoying. Durability: Having previously worked out in a shared gym I was always surprised by the number of people dropping weights onto the floor after completing a set. If you’re prone to dropping your dumbbells then the Bowflex SelectTech 552 are not for you. As mentioned they contain moving parts which can become damaged if mistreated. Weights: When lifting the dumbells out of their base, the weight not in use sometimes get caught and fall to the floor. Therefore you should always lift the dumbbells out of the base slowly, and not at an angle. As well writing as my own Bowflex SelectTech 552 review (below), I have summarised a number of genuine customer reviews. 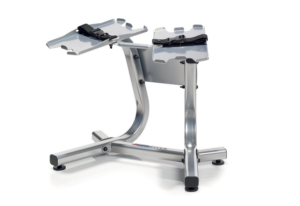 Many reviews praise the Bowflex SelectTech 552 for being ergonomic and practical. There are numerous five-star reviews on Amazon stating that this dumbbell pair is ideal for “those who don’t want a house full of weights”. Many people expressed the versatility of the dumbbell pair is what is astounding. Novices have purchased the Bowflex SelectTech 552 for basic working out, or working out with a regime such as P90X to get in shape. Other people say that this product is ideal for weight training and helps you build muscle quickly. While some customers expressed hesitation during the purchasing process, they have gone on to leave positive reviews saying they are pleased with the ease of use, durability, user-friendliness and the fact that it is appealing to look at, as some even deem the SelectTech to be ‘fashionable’. Concerns about safety: A number of customers commented that the weights are prone to coming lose. Whether that’s from falling out of the dumbbell base or because the locking mechanism failed, this is the most common complaint. It does seem that a number of complaints are in relation to dropping the dumbbells but some cited problems when using excessive force on the locking mechanism. Whilst some of these complaints are valid, I would discount any that were caused by dropping the dumbbells on the floor. Size: The overall size of the Bowflex SelectTech 552 is larger than some alternative models, if only by a couple of inches. This does make some routines awkward. Price: Some customers felt they were not getting value for money and that alternative models measured up jsut as well, for a lot less money. The best place to buy the SelectTech 552 is online. Not only do you bet better value for money but you usually get free home delivery, saving you carrying them home. At the time of writing you can buy on Amazon for $279.99 including free delivery. 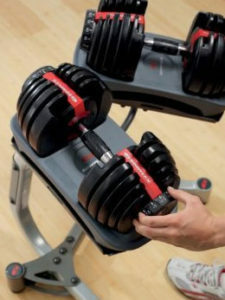 Depending on the accessories given and the condition of the dumbbells, the price can be higher or lower. Some listings on Amazon.com are as low as $190.04, and some are as high as $340. There are options for coupons and “freebie” options if you are able to research online in enough depth. I’ve loved using my 552 dumbbell pair and can happily recommend them to my readers. With my background in kettlebell training, I knew I would need multiple dumbbell weights to start gaining weight. As such, I wasn’t put off by the price tag because I was basically paying for 15 dumbbells in one. With this in mind it was important that I was getting quality, not just quantity. I’m happy to say that the Bowflex 552 delivers on both fronts. Firstly, the shape of the dumbbells is based on a traditional design. No matter what people tell you, different shapes affect the weight distribution which alters the feel when lifting the bells. I was impressed by how smooth and natural the 552 dumbbells felt during exercise. Unfortunately I will go short of awarding a 5 star rating for the shape/design. Being an adjustable dumbbell, the 552s do rattle slightly whilst working out. This can be annoying and especially because you feel the vibrations in your hands. You can minimize the vibrations by wearing padded workout gloves. Having said that, the handles are one of the standout features of the Bowflex 552. They are covered with additional grip and shaped to be ergonomically friendly. This means they fit your around your hands and reduce the chances of developing blisters or hard skin. A big tick from me. I also found it useful being able to adjust the weights by increments of 2.5 and 5 pounds. Whilst 5-pound increments are industry standard, the 2.5 pound increments ensure you are not over stretching yourself by overloading the weight. This is a great feature that can reduce the risk of injury. My only real criticism was in relation to the size of the dumbbells – they are larger than some alternative models. On occasion, the oversizing of the SelectTech 552 dumbbells causes them to bang against one another whilst working out with both dumbbells. For example whilst performing the double dumbbell curl (standing). Due to my size this only happened on occasion, but it could be more of a problem for people with smaller frames. In the back of my mind, I was also conscious of dropping the dumbbells and causing damage to the locking mechanism. Fortunately this has not happened yet. To conclude I am happy with my 552 adjustable dumbbells and would recommend to my readers. Together with my Stamina adjustable kettlebell, the 552 adjustable dumbbells have enabled me to start increasing my muscle mass. Bowflex SelectTech dumbbell stand by Bowflex: Measuring 26 x 19 x 22 the dumbbell stand is specifically designed to hold the 552 and 1090 dumbbells. Easy to assemble, this dumbbell stand is used to store the dumbbells before, during and after use. It gives your home gym a professional look and means no more bending over to pick up the dumbbells from the floor. It also comes with a built-in towel rail for those who work up a sweat while exercising. You can pickup the stand on Amazon for between $75 and $120 dollars. On one hand there is very little difference between the Bowflex 552 and the 1090, on the other hand there are massive differences. Essentially the design and build quality is identical. Both feature a twist dial to adjust the weight setting and from the outset the look very similar. The differences come when you compare the price and the weight range. For starters the list price of the Bowflex 1090 is double that of the 552. 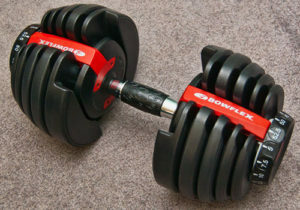 Remember that when you buy the Bowflex 552 you are getting a pair of dumbbells? But there is a reason for this. The 1090 has a much larger weight range, from 10 pounds all the way up the 90 pounds. That’s some serious weight. Unlike the SelectTech 552, you can only adjust the weights of the 1090 in 5 pound increments. Because of the superior weight range, the Bowflex 1092 is more suited to body builders or those who are able to lift heavier weights. One advantage of the Bowflex 1092 is that you can buy this dumbbell individually. But you’ll likely need to also purchase the Bowflex SelecTech stand as storing on the floor is not advised. Positives: You can adjust weights in increments of 2.5 and 5 pounds. Price is very competitive compared to alternatives. Larger weight range than alternative models at the same price point. Negatives: Need to be careful not to drop the dumbbells on the floor - this can result in damage to the locking mechanism. They dumbbells are also quite bulky. Positives: Weights can be adjusted from 10 pounds all the way up to 90 pounds - huge weight range that is suitable for all dumbbell workout routines. Unlike the 552 you can but this as a single or pair. Negatives: Expensive. You can only adjust the weight setting in 5 pound increments. You may need to purchase the dumbbells stand, these weights are heavy and it is not ideal picking them up from the floor. Bulkier than the Bowflex 552.